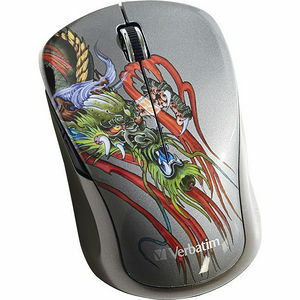 Get inspired with Verbatim's Tattoo Series of Multi-Trac Blue LED Mice - featuring exclusive artwork by tattoo artist Chris Nuñez! Perfect for anyone who demands performance, but has an artistic flair, these mice feature Blue LED technology, allowing you to navigate on virtually any surface - from a glass table to the granite kitchen counter! Pre-programmed for Windows 8 functionality, side buttons allow quick, easy access to the Windows 8 Application and Charms sidebars. For added convenience when traveling, the nano receiver stores neatly inside the battery compartment of the mouse.